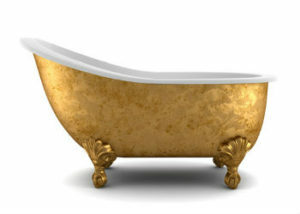 Benjamin Franklin imported the first bathtub to America – having it shipped from France in the 18th century. Franklin’s tub was reportedly made of sheet copper and had to be hand-filled with buckets. Recessed shelving/cabinets: Shelves and cabinets recessed into walls add storage space without taking up floor space. Space Above Your Toilet: Don’t neglect the space above your toilet. It’s a great spot for a cabinet, some shelves, or maybe a basket for toiletries or reading materials. Hang shelving: Putting in higher shelves for things such as spare towels can free up closet space for items that aren’t as nice to look at, and the height keeps them out of the way on a daily basis. Build custom cabinets: We can help you find a custom solution for odd-shaped spaces where standard cabinets won’t fit. You’ll pay a bit more, but you’ll be able to take advantage of unused space. If you’ve been considering a bathroom remodel – planning is key. What one change would make your bathroom more enjoyable and comfortable? Don’t hesitate to reach out to us and let us know your answer. We’d love to talk to you about your project, hear your ideas, and help you with the process.